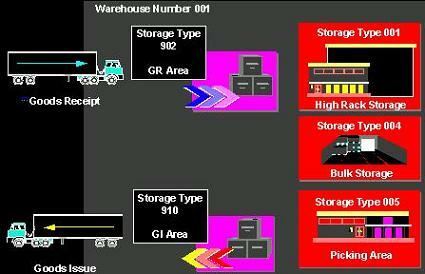 A storage type in SAP WM ( Warehouse Management ) is defined as the physical or logical divisions of the entire warehouse where we are storing the goods. It consists of the area, facility or zone of that warehouse. The following picture shows an example to get the clear idea about how different storage types are used with ware house number and all in SAP software.